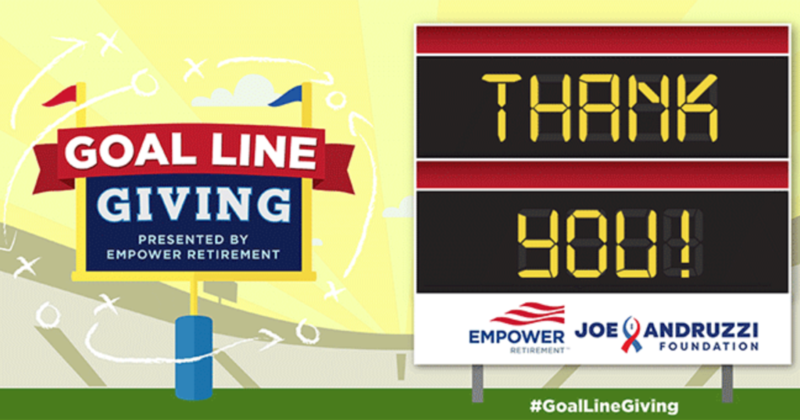 The Joe Andruzzi Foundation once again teamed-up with Empower Retirement to tackle cancer’s impact on the football field through the 2018-2019 Goal Line Giving campaign! For every point New England scored during the 2018 regular season, Empower Retirement pledged to donate $50 towards the Joe Andruzzi Foundation’s mission of providing financial assistance to cancer patients and families – helping them focus on recovery, not bills. After a successful year on the field, New England scored a total of 436 points – equaling a donation of $21,800. Empower Retirement then generously rounded-up the donation to an even $25,000 donation! Thank you, Empower, for your commitment to JAF’s mission, as well as everyone who followed along and engaged-with the 2018-2019 campaign!